Judy Myers is associate professor of nursing at IU Southeast, current chair of the diversity committee and coordinator of public health nursing services in the School of Nursing. 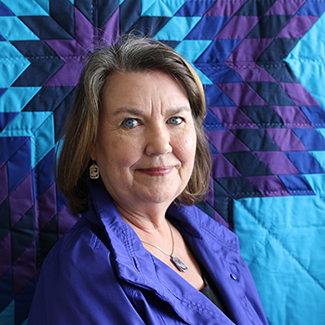 She joined the faculty in 1997 and immediately began implementing a community-based nursing curriculum featuring partnerships with a variety of local agencies. Her scholarly work has been published in academic journals, books and conference proceedings, and she has contributed to training manuals and case studies in addition to investing the bulk of her energy in teaching, professional service and forging links with the community. Myers is a nurse educator, holistic nurse specialist and sociologist with expertise in psychiatric/mental health nursing, complementary therapies, women’s health, public health, social change and inequality. The impact of her work is similarly wide-ranging. Among many distinctions, she was awarded the first faculty fellowship of the IU Southeast Academy for Leadership and Diversity in 2010, and most recently received a national merit award for program innovation from the National Association of Housing and Redevelopment Officials. Her current research focuses on the clinical and biochemical effects of massage therapy on fatigue and insomnia among women undergoing radiation therapy for breast cancer. Prof. Myers spoke with academic information officer, Steven Krolak. How does your varied academic background inform your research and teaching? Before I came to IU Southeast I taught and practiced public health nursing in Central Appalachia and it was through this experience that I learned the value of partnership and collaboration. I also witnessed the harm done, when researchers and other “experts” come into poor communities with their own agendas and ignore the wisdom of local people. It was my involvement in developing lay health worker programs in Kentucky that sparked my research interest in social inequality and socio-cultural barriers to health, and ultimately led to pursuit of a Ph.D. in sociology. Going outside of my discipline for doctoral study at age 45 was far more difficult and took much longer than I imagined, however, it has been a good fit for me, as social justice and the care of vulnerable populations have long been at the core of public health nursing. It also allowed me to learn first-hand the benefits and the challenges of crossing disciplinary boundaries; lessons that served me well, more recently, as coordinator of an interdisciplinary research study at Floyd Memorial Hospital and Health Services Cancer Center. What does the term “whole-person education” mean for you? Whole-person education focuses on dimensions of learning that go beyond intellectual development. My understanding of how to teach from a whole-person perspective rests on two basic assumptions, namely that every student is uniquely different from any other by virtue of background, talents and gifts; and that all students come with the desire to learn to be excellent nurses. I strive to create a learning environment where students can expect open and honest communication, where diversity and difference, cooperation and collaboration are respected and valued. The role of the teacher is as role model, mentor or coach rather than all-knowing, infallible authority figure. I encourage students to be gentle and kind to themselves and to each other, to struggle less with the need for perfection, to see mistakes as learning experiences rather than sources of shame and self-limitation. This is a great challenge in nursing education, where admission is highly competitive and mistakes can have life-threatening consequences, but that is all the more reason for students to feel it is safe to “not know” and to request support from faculty when needed. Nurses rely on finely honed critical thinking skills and intuition to know what to do in complex, stressful situations. The classroom and clinical settings are arenas where every encounter is an opportunity for students to learn not only discipline-specific knowledge and skills, but also how to cultivate empathy and the capacity to establish authentic caring relationships with self and others. How do you view the importance of curriculum development? In nursing education, the curriculum is always evolving. There are many gaps and deficiencies in our health care system and thus there are ongoing challenges to improve quality and safety. Technology is ever evolving and expanding, as is the knowledge base that guides nursing practice. Deciding what we must add to stay current, and what can be eliminated to avoid overload for faculty and students is an ongoing challenge within individual courses and in the overall program. For me, the curriculum is also a mechanism for planned change. When my awareness is triggered that something is simply wrong, unethical or contradictory to established standards of best practice, being involved in curriculum development allows me to look at my circle of influence (nursing education) and ask myself if there is something I can do about this at the level of system change. Such was the case some years ago while volunteering as an emergency room advocate for victims of domestic and sexual abuse. I saw an urgent need to help nurses become better prepared to address the needs of women who had been raped or beaten. In collaboration with colleagues Mimi McKay, Pam White and the Center for Women and Families staff, the format for teaching domestic violence and sexual assault was changed from a single one- to two-hour lecture to intensive, experiential workshops that IU Southeast nursing students have participated in since 1999. How does your passion for the integration of alternative interventions inform your work? My passion for integration of holistic therapies with conventional bio-medical treatment and nursing care began during my nursing program at Murray State University in the 1970’s. But it wasn’t until 1986, after my dad was given a grim diagnosis of late-stage lung cancer, that I looked more carefully at complementary and alternative therapies as a curricular issue. After exploring the literature, I was astounded that we knew so much, yet did so little to build and support the immune system of patients undergoing toxic treatments for cancer. I learned about therapies, such as aromatherapy, massage, guided imagery, therapeutic touch, acupuncture, herbs and whole foods, many of which had been shown to prevent or alleviate a wide range of side effects and symptoms yet were not included in conventional schools of nursing and medicine. In 1987, I developed an elective course to teach integration of these therapies and have been teaching some version of it ever since. It is encouraging that integrative care is now the standard in most major cancer treatment centers in the United States, and The Art and Science of Complementary Therapies (K301) is a required course for students in the RN-to-BSN program at IU Southeast. How does the relationship you have built with Floyd Memorial Hospital benefit the students of IU Southeast? My relationship with the Cancer Center at Floyd Memorial Hospital began when the School of Nursing was asked to assist the staff to design a study to investigate the effects of massage therapy as an intervention to prevent or reduce the debilitating side effects often experienced by women undergoing radiation treatment for breast cancer. I had just completed a 12-month fellowship at the University of Louisville in oncology, and with my background in sociology, I was intrigued by the opportunity to conduct a randomized clinical trial using a community-based action research (CBAR) model. Building the research team was the first step, and when all was said and done our team was composed of members representing nursing, medicine, radiation oncology, biology/immunology, cancer care administration, massage therapy, as well as bio-statisticians from IU Southeast’s Center for Applied Research. Securing funding and conducting the study took over three years. During this time eight undergraduate students served as research assistants. Several of these students told me their involvement as a research assistant was a major motivating factor in their decision to pursue graduate school. Involving students in this research partnership with the Cancer Center at Floyd Memorial took the joy and satisfaction of mentoring students to another level. Indeed, the students were instrumental to the success of this study, and because they understood the importance of their role, their desire to learn was enhanced as was the depth of their learning about the research process and the specialty area of oncology nursing. What is the community-based nursing curriculum, and how does it help IU Southeast students? Student and faculty engagement in the community enhances our success in achieving program outcomes and is vital to the mission and aims of the School of Nursing and the University. Indeed this area of curriculum development is described as a strength of our program in the self-study report prepared for accreditation by the American Association of Colleges of Nursing in 2010. It is a source of pride that for nearly two decades, faculty and students from IU Southeast School of Nursing have been providing a wide range of health promotion programs in local schools, health departments and community agencies. For over a decade, faculty and students have provided pre-natal classes to incarcerated women at the Kentucky Correctional Institute for Women, health screenings and home visits to Amish families and school children in Washington County. More recently, we have established educational partnerships with New Albany Housing Authority, Providence Self-Sufficiency Ministries, and The Villas of Guerin Woods in Georgetown, Ind. All of the faculty (full-time and adjunct) who teach courses with community-based clinical experiences devote substantial time and energy to maintaining quality learning experiences that will motivate and inspire students. Student experiences are richer when the instructor is engaged and has a credible presence in the agencies to which students are assigned. To achieve this goal, faculty often provide volunteer services within the agencies with which we affiliate. Community engagement helps students develop cultural humility and competence in providing nursing care. In community settings students have the opportunity to push themselves, to stretch beyond their field of “cultural comfort.” As coordinator of public health nursing it is my job to make sure students have a safety net and the support needed to learn and grow and not be overwhelmed by the cultural differences and complex social problems they are apt to encounter. It is music to my heart, each time I read a journal entry or listen to a student tell me how surprised they are to learn that their stereotyped perception of a homeless person, a convicted criminal, a person with mental illness or someone from a different ethnic or racial background has been shattered, and this happens more often than not when students and faculty are engaged in the community.